Zemmrate » Cooking tips » How to cook lentils. 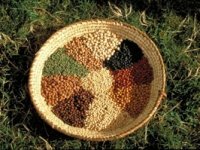 This culture belongs to the legume family. And people began to cook lentils in ancient times. Surprisingly, in Russia in the Middle Ages was not lentils less popular. 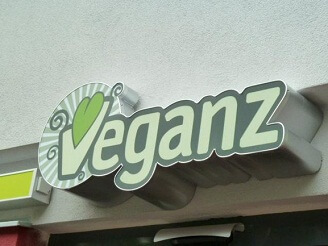 Unfortunately, currently lentils - is likely exotic, but not everyday dish in the daily diet. 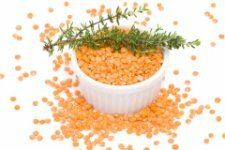 Focus lentils feature is its sustainability, it does not accumulate toxic elements, nitrates, radionuclides, and so on., this means that the lentils are quite harmless to health and human nutrition. Lentil has a number of medicinal properties. 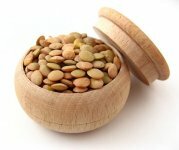 For example, lentils recommended for nervous disorders, diseases of the cardiovascular system, kidney stones, diabetes, problems with the digestive tract. Since lentil dishes contains a sufficient amount of potassium, they are very useful for hematopoiesis. At this healing properties lentils do not end. Due to the high fiber content, lentils can be used as a prophylactic cancer, particularly colon cancer and breast (in women). Particular attention should be paid to the lentils pregnant women. 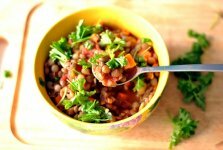 Eating lentils positive effect on fetal development. Moreover, the regular use of lentils in food strengthens the immune system and raises vitality. 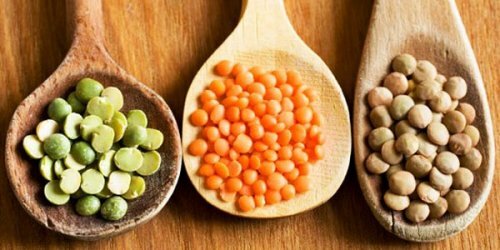 In the study of lentils it was found that 100 g of cereal provides approximately 14 g of water, 25 grams of vegetable protein, 54 g of complex carbohydrates and only 1 g of fat. 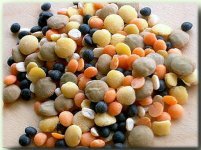 Eating even a small amount of lentils, you will be fed, and the get the required amount of protein, carbohydrates, which help to maintain a sense of saturation. Thus, this product is an indispensable dish diet. 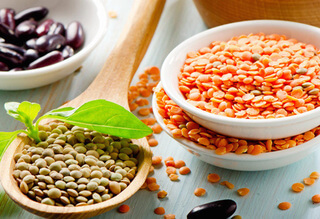 The structure of folic acid include lentils, therefore lentils is an indispensable source of iron. In lentils contains a sufficient amount of starch, vitamins, potassium and other elements. Once again, referring to the nutritional part of the product, it is worth emphasizing that the calorie 100g lentils is 310 kilocalories. - Green lentils known as French. 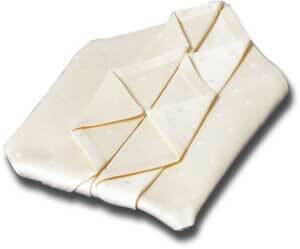 It can be used for cooking a variety of salads and meat dishes . Lentils do not fall apart, which is an advantage of this culture. - Brown lentils - a ripened crop. She's getting ready faster than green and has a pleasant nutty flavor. Unlike the French lentils, this can seethe and turn to mush. Brown lentils more often used for cooking casseroles, soups, or added to stews. Red lentils known as Egyptian. She does not have a shell, she cooks faster than other varieties and is perfect for mashed potatoes. Red lentils are widely used in Asian cuisine. As mentioned previously, in virtually lentils contains fat, but a high content of protein and fiber. Compared with other legumes lentils have a number of advantages. First, it is not necessary to soak lentils, simply rinse it. Lentil easily and quickly cook different soups, cereals, mashed potatoes. More complicated dishes - meatballs, meatballs, lentils with bacon, etc. Lentils are combined with garlic and onion. Before cooking lentils need a good wash and remove foreign debris. To make better use of washing a colander with small holes. Salt best added at the end of cooking, as salt water lentils cooked longer. For 1 cup of lentils you need 1.5-2 cups of water. Not to digest lentils, throws it into the boiling water. Then let the water boil again and then you can reduce the heat. Best lentils cook, covered. 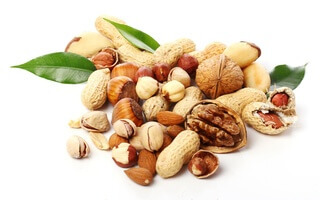 You will need about 15-30 minutes depending on the variety. Periodically stir grits and check for taste. Chop the onion and garlic. Boil water, add all ingredients simultaneously. Once again, bring to a boil, cover the pan, reduce heat to low and simmer for 10-40 minutes (depending on the type of lentils). Do not forget to stir that lentils do not stick together. If there are fresh tomatoes, tomato sauce, replace them. 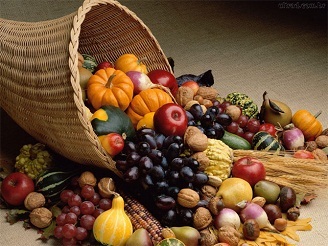 Moreover, in a dish, you can add the rice, and various vegetables and a variety of spices to your taste. 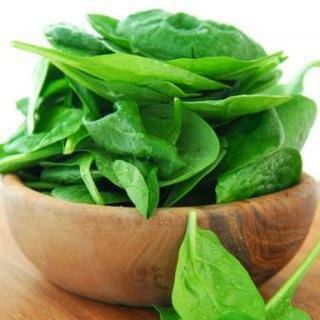 ﻿ How to cook lentils ﻿ Interesting facts about nuts ﻿ Spinach is a vegetable? 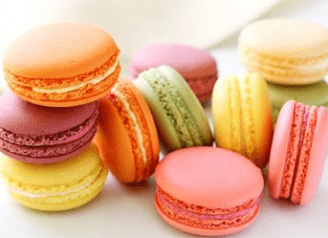 ﻿ Diet Amazons ﻿ Useful and harmful products. 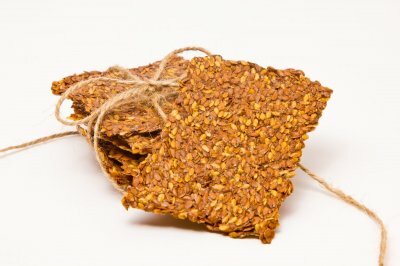 ﻿ Mothers Day Vegetarianism (November 1) ﻿ Crispbread and their effects on the body ﻿ Diet for blood group 1. ﻿ Secrets of working with the dough. ﻿ All of puff pastry. ﻿ How to cook lentils.